Increased vascular endothelial growth factor (VEGF) receptor expression has been found at the sites of angiogenesis, particularly in tumor growth areas, as compared with quiescent vasculature. An increase in VEGF receptor-2 is associated with colon cancer progression. The in vivo detection of VEGF receptor is of interest for the purposes of studying basic mechanisms of carcinogenesis, making clinical diagnoses, and monitoring the efficacy of chemopreventive and therapeutic agents. In this study, a novel single chain (sc)VEGF-based molecular probe is utilized in the azoxymethane (AOM)-treated mouse model of colorectal cancer to study delivery route and specificity for disease. The probe was constructed by site-specific conjugation of a near-infrared fluorescent dye, Cy5.5, to scVEGF and detected in vivo with a dual-modality optical coherence tomography/laser-induced fluorescence (OCT/LIF) endoscopic system. A probe inactivated via excessive biotinylation was utilized as a control for nonreceptor-mediated binding. The LIF excitation source was a 633-nm He:Ne laser, and red/near-infrared fluorescence was detected with a spectrometer. OCT was used to obtain two-dimensional longitudinal tomograms at eight rotations in the distal colon. Fluorescence emission levels were correlated with OCT-detected disease in vivo. OCT-detected disease was verified with hematoxylin and eosin stained histology slides ex vivo. High fluorescence emission intensity from the targeted probe was correlated with tumor presence as detected using OCT in vivo and VEGFR-2 immunostaining on histological sections ex vivo. The inactivated probe accumulated preferentially on the surface of tumor lesions and in lymphoid aggregate tissue and was less selective for VEGFR-2. The scVEGF/Cy probe delivered via colonic lavage reaches tumor vasculature and selectively accumulates in VEGFR-2-positive areas, resulting in high sensitivity and specificity for tumor detection. 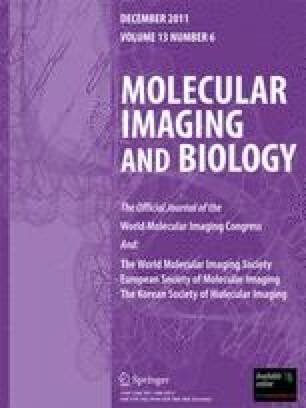 The combination of OCT and LIF imaging modalities may allow the simultaneous study of tumor morphology and protein expression for the development of diagnostic and therapeutic methods for colorectal cancer. This work was supported in part by grants from the National Institutes of Health, R01CA109835 and R43CA132528. Additional funding was provided by Achievement Rewards for College Scientists, Technology Research Initiative Funding, and the Philanthropic Educational Organization. The authors also thank Erica Liebmann, Yue Zong, and Amber Luttmann who contributed to this study. Dr. Joseph Backer has equity in SibTech, Inc., maker of scVEGF/Cy and inVEGF/Cy. The other authors have no conflict of interest.